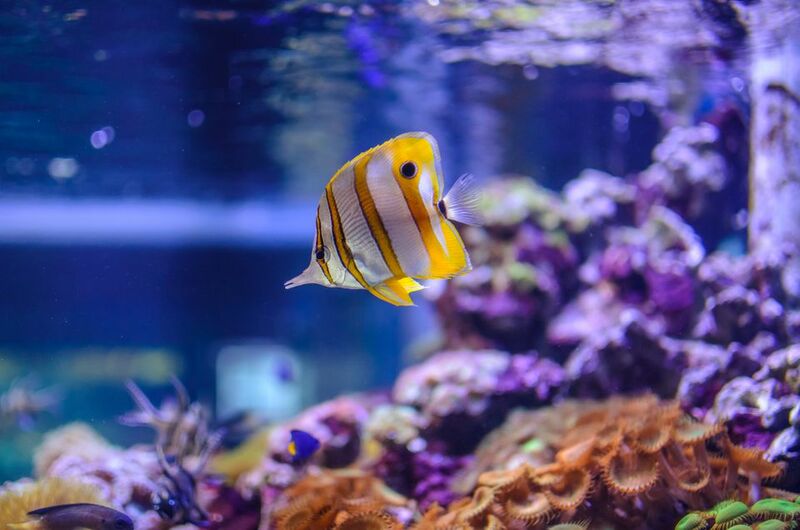 Whenever electric appliances are used in close proximity to saltwater aquariums, the potential for problems increases dramatically. Fortunately for most saltwater aquarists, a vast majority of equipment used in conjunction with an aquarium is of high quality and seldom fails. However, when an appliance does fail and leaks electricity into a tank, it is called "stray voltage". Putting electrical appliances in freshwater can cause enough problems. But when you add the corrosive effects of salt to the equation, the potential for electrical problems increases dramatically. Even salt creep can cause corrosion in metals. Stray voltage, even in small amounts, can cause a number of subtle or dramatic problems in an aquarium. Anecdotal evidence in aquariums, as well as observations of fish in close proximity to hydroelectric dams, have indicated that stray voltage could be a possible cause of HLLD in fish. Many aquarists have tested for voltage leaks in their tanks after experiencing a sudden and otherwise inexplicable loss of fish in their tanks and found that a faulty appliance used in conjunction with their tank was the cause. There have been faulty aquarium heaters on the market which have suffered a complete meltdown which resulted in the complete loss of all fish and invertebrates in saltwater aquariums. One manufacturer covered the cost of the losses for these customers and replaced the heaters, but the aquarists with the faulty heaters would have preferred that the incidents never happened. Detecting the voltage leaks at an earlier stage could have prevented the disaster. When continuous strange behavior such as a rapid and jerky swimming pattern or frequent quivering of tank inhabitants is observed, many aquarists have discovered that the cause was stray voltage. Fish have sensors on their bodies, such as along the lateral line and on their noses, which are sensitive to changes in electricity in the water around them. When these sensors receive a continuous supply of abnormally high electricity, it throws their systems out of kilter. An example of how this has been put to our advantage in the "shark repelling"devices for swimmers and surfers that have been developed. These devices emit a small amount of electricity into the water around the swimmer/surfer which the sharks pick up as they approach, find that it makes them uncomfortable and so they swim away. Purchase or borrow a voltage meter. They can generally be found for less than $20 at most automotive parts or hardware store. Turn the selector to "120 AC Voltage". Insert the tip of the black probe into the third or "grounding" hole in an electrical outlet. Insert the metal tip of the red probe into the tank water. Watch the meter needle for any movement. Any needle movement indicates a voltage leak in your system. One at a time, disconnect each electrical appliance (heaters, pumps, lights, chiller) associated with your tank, retesting for voltage as described above after each unit is disconnected. Heaters and pumps (powerheads) are the most frequent cause of voltage leaks. These devices have 120 volts of electricity feeding into them, which is enough to do a lot of damage in a saltwater aquarium. Replace (recommended) or repair the faulty unit. Test the tank once again to make sure that you have eliminated the problem. Install a simple grounding probe in the tank to avoid damage to the tank inhabitants. This may temporarily take care of the symptoms of stray voltage, but it does not cure the cause of the problem. Many aquarists test their tanks for stray voltage on a regular basis as a part of their normal tank maintenance routine. Detecting a voltage leak problem in its early stages can help eliminate or reduce problems in the future.